The new order in a connected world. The netarchy is a new paradigm that draws a bold new way to build the organizations of the future. A new organizational structure designed for a new interconnected world. The netarchy complements the organizational structures inherited from the past and provides a systematic approach to keep us competitive when the change is discontinuous and the future is less and less an extrapolation of the past ..
To compete and win in a world of accelerated change, we need a second network-based organizational architecture, which allows organizations to innovate, adapt and interact with the new reality, complementing the hierarchy so that it can do, what Is optimized to do. The Netarchy goes beyond the hierarchy. It is possible to coordinate human effort without sacrificing people’s passion and creativity. Netarchy is the natural structure for initiative, creativity and innovation, capabilities that the hierarchical organization alone simply can’t provide. How to respond with enough speed and agility in a world of accelerated changes ? Is trust a viable alternative to control in the management of our organizations? 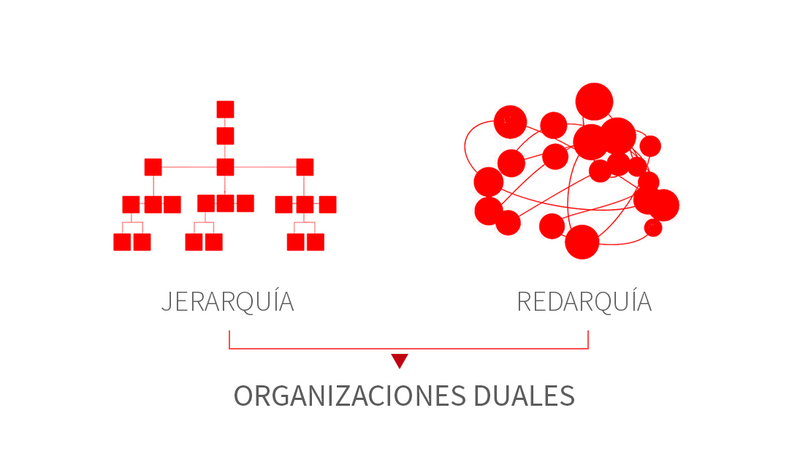 How to build dual organizations: able to be predictable efficient, agile and flexible? How to connect with the collective intelligence of our organizations? How to avoid being trapped in our past experiences? How does netarchy impact leadership? What is the new role of the leader as a Social Architect? The way to apply the Netarchy is to establish dual organizations capable of finding a new balance between the hierarchy as a guarantor of predictability and control, and the Netarchy as an engine of purpose, innovation and growth.